Successfully Added DOOGEE LEO DG280 Android 4.4 Smartphone - 4.5 Inch IPS Display, MTK6582 Quad Core 1.3GHz CPU, Smart Gestures (Red) to your Shopping Cart. The DOOGEE LEO DG280 Android 4.4 Smartphone boasts a 4.5 Inch IPS Display, a MTK6582 Quad Core 1.3GHz CPU and Smart Gestures. DOOGEE LEO DG280: Feal The Roar! 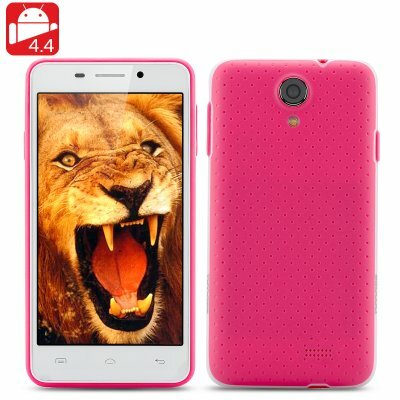 In Chinavasion, the Lion roars tonight as DOOGEE have released this excellent Android 4.4 smartphone that is surely a hit. This is the DOOGEE DG280 and features a compact 4.5 inch screen as well as another exterior feature that immediately catches the eyes is its rugged back. The rugged back feels comfortable in the palm of your hand and its anti-slide design has cleverly been thought about. In addition, the DG280 smartphone incorporates a heat exchange design that keeps it cooler at all times. Like all DOOGEE phones, it supports two SIM cards that work on a variety of 2G GSM and 3G WCDMA bandwidths, plus there is a slot to support micro SD cards of up 32GB making in convenient for additional memory. We are looking at a practical and useful mobile phone here as internally, the DG280 boasts a MTK6582 1.3 Quad core processor, 1GB of RAM plus 8GB of internal memory and a 4.4 Android operating system. It is also equipped with a 5 megapixel rear and 1.3 megapixel cameras that also has post capture technology functions to make your photos look even better. Last but not least, the battery is an 1800mAh combined with ultra-effective energy-saving mode which allows for a long battery life. Furthermore, the DG280 will come with the cool Guesture motion feature that allows you to answer the phone just by just shaking it when receiving a call. System motion is also included, which allows youlock your phone just by double tapping the home key. With the heart of a lion and a mind to rule the jungle, this smartphone has everything you really need and more.